AlertSite customers who use private locations (Private Node Server, InSite, or PrivateNode EndPoint) can configure connectivity alerts to get notified when the private locations stop reporting data, for example, because of network connection issues. Connectivity alerts are an easy-to-use alternative to ServerAgent, or can be used together with ServerAgent for greater efficiency. Connectivity alerts work with all versions of Private Node Server, InSite hardware appliances, and PrivateNode EndPoint. Private locations connect to the AlertSite platform at regular intervals to send the monitoring results and to indicate that the location is up and running. 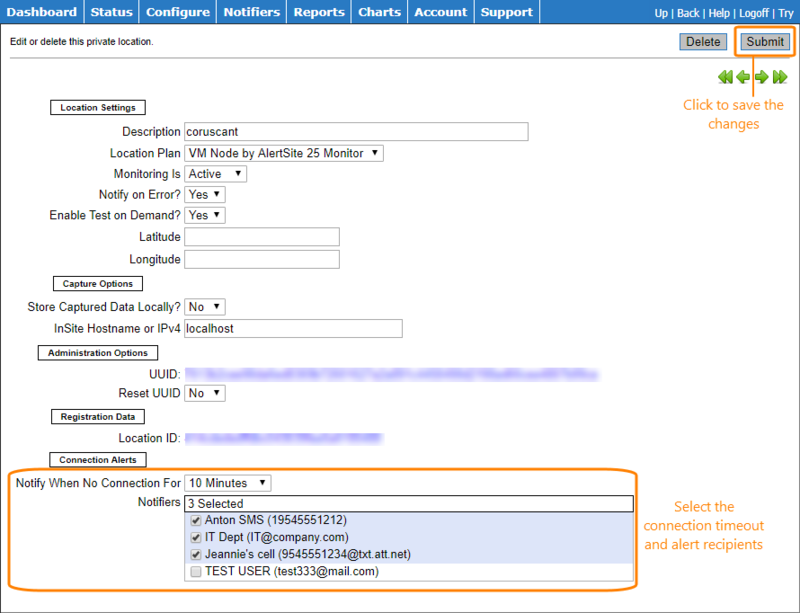 Admin or Co-Admins can select the maximum time interval within which each private location is expected to report to AlertSite, and the recipients to notify about possible collection loss. Whenever AlertSite does not receive any data from a specific location within the defined interval, an alert will be sent to the corresponding recipients. Connectivity alerts have status code 4050. When the connectivity is restored and the location resumes sending data to AlertSite, a “clear” alert (status 0) is sent. These alerts are sent from the IP address of the primary AlertSite location configured for your account in > Settings > Public Locations in AlertSite UXM (or in Account > Manage Account > Locations in AlertSite 1.0). Make sure this IP address is whitelisted in your firewall. Connectivity alerts follow recipient rules for monitor availability alerts and will not be sent to recipients who have availability alerts disabled. Admin and Co-Admins can configure Private Node Server connectivity alerts. Add the necessary alert recipients (if they do not already exist). Optionally, change the consecutive alerting options as required (Alert after this # of consecutive errors and Stop alerting after this # of consecutive alerts). Go to > Settings > Private Locations. Click next to the location in the list. Alert when no connection after this time (minutes) – connectivity alerts will be triggered after the specified number of minutes of not receiving any data from the location. Connectivity alert recipients – select the recipients to notify about connectivity problems with this location. Note: The Notify on error option does not affect connectivity alerts, it affects monitor alerts only. Select Notifiers from the top menu of the AlertSite 1.0 console. Optionally, change the consecutive alerting options as required (Notify me after … consecutive error(s) and Stop notifying me after … consecutive notification(s)). Select Configure > InSite Locations from the top menu. Click the location in the list. Notify When No Connection For – connectivity alerts will be triggered after the specified number of minutes of not receiving any data from the location. Notifiers – select the recipients to send the connectivity alerts to. Note: The Notify on Error? option does not affect connectivity alerts, it affects monitor alerts only. Repeat the steps for other private locations. You can customize the contents of connectivity alerts sent to the recipient types listed below. There are separate templates for error and “clear” alerts. Make your custom templates the default ones. Note: The abovementioned e-mail templates are also used for ServerAgent alerts, and JSON templates are also used for monitor availability alerts, so any changes in the default templates will also affect ServerAgent and monitor alerts. In the Alert Log, connectivity alerts have the PrivateNode Monitors label. You can see the name of the location that lost connectivity, and was notified about this problem. Connectivity alerts do not support recipient groups and SNMP recipients. Connectivity alerts are not included in the Notification Detail report.